Tomorrow (July 1st) we’re blessing your backs & heads once again, one new t-shirt graphic and a custom Long Beach State hat. Setting it off with the shirt, dubbed “Friend Or Foe” the graphic depicts a citizen who broke a kapu, which is an ancient system of laws & regulations. According to Hawaiian history, breaking a kapu was considered a corporal offense – as well as a threat to spiritual power. Breaking any kapu was punished by death, hence the graphic of a citizen tied to a tree being tortured. The graphic is printed in black & white on an all black tee, the back features our FITTED crown in white. Moving on to the Long Beach hat: all gray cap with a black brim and green underside, featuring a black LB logo with a yellow stroke and yellow New Era logo. Tomorrow (June 28th) we’re releasing a new t-shirt dubbed “Ha’a” plus a new custom MLB. Ha’a translated from Hawaiian to English means: “A dance with bent knees.” With this shirt we pay homage to the ancient art & culture of the dance / hula. Printed on a black tee, the front graphic features a statue of a girl kneeling as if she’s about to perform the ha’a, while the back features the FITTED crown. Both front & back graphics are ran in purple. On to the hat: New York Mets on an all black hat with an orange & blue Mets logo and green underbill / top button. Another FITTED MLB x t-shirt drop this coming Tuesday (June 17th) featuring 2 new custom MLBs. First up is a crazy custom New York Mets: the 2 front panels are in doeskin, back 4 panels are dark green and woodland camo brim with russet red stitching, cardinal red underbill – the Mets logo featuring russet red with a greenbay stroke surrounding it. Next up, an LA Dodgers on black wool with an orange brim, teal underbill, teal button and calypso green LA logo with a lemon fluff stroke. With the shirt, we took everyone’s favorite city, “Honolulu” and threw it on an all black tee giving it somewhat of a metropolitan feel, using the same colors utilized on the 2 caps, the back sees the FITTED crown in white with orange & teal stroking to give it a 3-D feel. One word, Fresh. This Saturday (June 21st) we are unleashing 2 new t-shirts and 2 new custom MLB caps on your backs & heads. Setting things off with the hats: Washington Nationals which we flipped in the Washington Redskins colorways: cardinal wool cap, gold brim, brown underbill and brown “W” logo with a merit gold stroke. Next up is a New York Yankees on a gray flannel wool (the 4 back panels) and navy blue wool on the front 2 panels with a white “NY” logo. On the t-shirt side of things are two standard FITTED logo tees we ran in colors matching the two previously mentioned hats: silver with FITTED in navy blue and white FITTED crest across the chest and navy FITTED crown on the back; and gold with FITTED lettering and crest in red as well as a FITTED crown printed also in red on the back. Bombing Waimea Rock, Sandy’s Shorebreak, Slippahs, Surfing, Cruising Kuhio Ave, Chasemaster, Sham Battle, Camp Erdman, Hooking O’ama, Merrie Monarch, Sea Life Park, Beef Stew Plate Lunch, Kanekapila’s, Lau Lau, Lomi Salmon, Pickle Mango, Shoyu Mango, Li Hing Mui Watermelon, Pot Lucks, Field trip to Ice Palace, Kamehameha Day, Hawaiian Sun, Pog, Lani Moo, Makahiki, Chicken Fights, Scrapping, Iolani palace, Bishop Museum, North Shore, West Side, East Side, South Shore, Big Island, Maui, Moloka’i, Kaho’olawe, Lana’i, Oahu, Kaua’i, Ni’ihau, The Makaha Sons, Peter Moon Band, Olomana, Gabby, Kalapana, C&K, Jawaiian, Aunty Bangles, Papa & Tutu’s House = HOME GROWN!!!! Keeping it simple..2 caps for Tuesday: SF Giants on duck moss featuring a paprika orange SF logo with a field green + white stroke and dark green underbill. 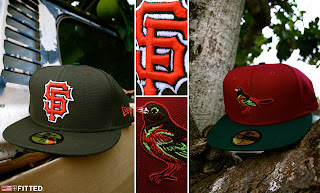 Next hat is a Baltimore Orioles custom on a cardinal wool cap; the oriole features an intricate pattern of colors, dark green bill and brown underbill. No longer are the days of the old tradition. We have a full blown Metropolitan city with all its crease’s. Some of the countries best strip clubs, as well as the best beaches, Drugs & crime litter rural to urban areas of the island. Tourism is the wheels that move us forward, and some outsider’s run to international market place thinking they are going to find authentic Hawaiian trinkets. But when you wake up to the ocean everyday and the sun is shining what really can go wrong? I wouldnt want to be anywhere else! Which leads us to our next t-shirt that will set this summer off: Paradise Lost. Printed on all black, the front features two teal palm trees with FITTED printed in magenta sitting beneath the trees. The back features “Paradise Lost” in magenta with a flock of birds in the background, more palm trees, hibiscuses and a flamingo chilling in the cut. 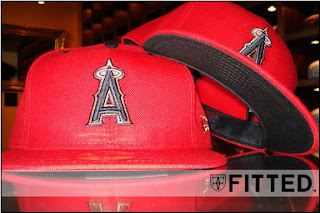 Custom Angels Hat: Scarlet Body With Copper and Graphite embriodery. We also have tank tops in stock and perfect for the summer. Call or come through.. Growing up in the early eighties, I got to experience the Hawaiian resurgence first hand. Spending summers at the Reppun’s farm learning to work the Lo’i fields. Fishing, hunting, learning to make ‘Ulu maika and spears for games, how an imu works, and most importantly how sacred our culture is. Now that I am grown and have been able to travel, I look back at those important years with fond memories of a culture that I truly love and respect. It was about 1984 or so when my parents started a business called Mana’olana Crafts and decided to try their hands at Hawaiian arts. My step dad was a historian of Hawaiian craftsmanship and had this idea to hand make traditional Hawaiian artifacts as miniature ornaments. The Pū’illi (bamboo rattles for Hula dance), Ipu heke (Gourd drums with a top section for hula), Lomi sticks (massage sticks), hair picks and ‘Umeke made of Koa. But the piece that I enjoyed making the most was the mākini helmets. My parents would make my sister and I hand pick kamani nuts, take them home to clean and sand so they can begin the construction. We used kamani nut as the base, ‘uki grass on the top (later replaced it with Feathers) and raffia in place of the kapa. After months of preparations we would pack up all our work in the Volkswagen van and hit the craft fair circuit. If you were around in the early to mid 80′s then you’d know how big the craft fairs were. This leads me to our latest FITTED release. “Makini” in Hawaiian means a group of spears tied together, used as a battering ram in war. It also has a meaning of many deaths; death dealing. There are 2 different stories of what these gourd masks were actually used for. One popular belief was that the helmets were worn by a secret warrior society entrusted with the protection of the highest ali’i (chiefs) of ancient Hawaii. With this theory, it is said that the crest was made out of ‘uki (or a tough sedge). The term “ikaika” (which translates to ‘strong’) became popular in the early-mid 80’s when A brand called Master Graphics and another brand called Hawaiian Strength ran t-shirt’s with the word Ikaika Warrior and a muscular figure wearing a gourd mask. Even to this day, you may see these hanging from a rear view mirror as an ornamental piece, or worn as a necklace. The other story is that the mākini were worn by moʻo Lono (the Lono priests) as part of their ceremonies for the Makahiki season. 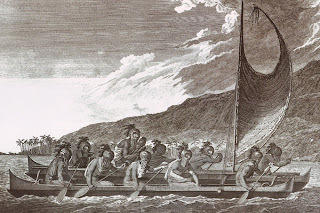 This goes along with all the theories of Captain Cook being perceived as Lono returning to the islands, as depicted in John Webber’s painting (refer to picture) of a canoe full of mo’o Lono, in which one of the priests appears to be holding a statue of the God Lono. According to Hawaiian mythology, Lono (who is one of the four main deities, amongst Kū, Kāne and Kanaloa) was a God of peace. However, Both theories could be tested due to the fact that this was prior to any contact with Western culture, and before Hawaiians had learned to read and write. It is not known whether this event in the aforementioned painting was at the start of a war, or the beginning or ending of the annual Makahiki (a festival in which work and war were kapū). It is now 2008 and we wanted to use our platform to educate people through our medium. We take design very serious and hope that all of you appreciate the details that we put into this hat. To start off, the overall look of the hat is tough. The front embroidery is where the gourd would have been cut out for the eyes. 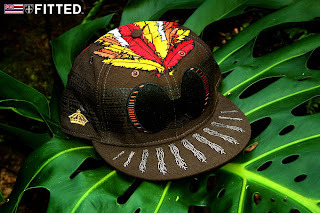 Around the base of the whole hat is a water based tattoo print to signify strength. The bill has embroidery of strings that would have been the place for the kapa. On the crown of the hat is intricate feather embroidery that has taken the place of the ‘uki grass. With the old tradition we added some modern elements like the triangle satin lining and on the under bill we have built upon the dual theories with this olelo No’eau. ” Pupukahi i holomua” which translates to: “UNITE TO MOVE FORWARD” and to break it down: “BY WORKING TOGETHER WE MAKE PROGRESS”. This drop consists of the Makini hat, along with a matching white long sleeve t-shirt and a red short sleeve t-shirt. 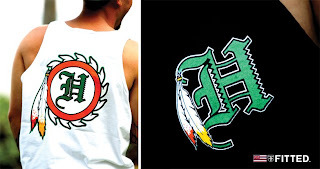 Both tees feature the same feather pattern seen on the hat on the backside of the each shirt. The long sleeve has a tribal tattoo pattern up and down each sleeve and the short sleeve has the same pattern running from bottom seam to arm pit. Phone orders will be taken from 1pm on until supplies last. 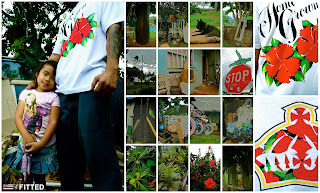 Big Mahalo’s to Big Cuzzo Garrison, Baba & Keone, The Noyles, And everyone else who made this project possible. Since Wednesday is a big day for us with the Kamehameha day release were keeping it fairley Lite. 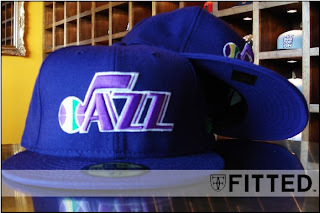 Two custom Hats 30 pieces each, starting first off with a Utah Jazz custom: a purple cap with the classic Utah Jazz logo in purple, shamrock green and lemon yellow, the left side panel features a green New Era logo and the back uses the music note Jazz logo in purple, green and lemon yellow. 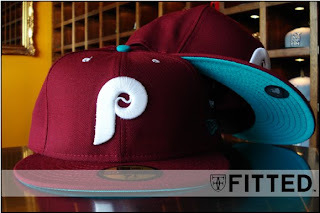 Next is an MLB custom: Philadelphia Phillies in an all cardinal red cap with a white “P” logo, teal button and underbill and a calypso green New Era logo (hit on the right side) and MLB logo (hit on the back).